2017 saw Dunlop forge a new partnership with global racquet manufacturer Srixon in an effort to recapture market share. This partnership made a splash when sponsored pro Kevin Anderson reached the 2017 U.S. Open Final. 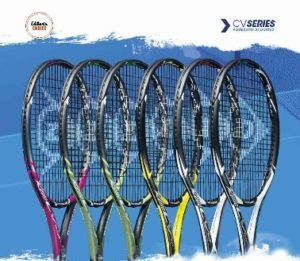 The companies are introducing 3 new lines of racquets for 2018. These lines share common technology while be targeted at different types of player. All of the racquets take advantage of Sonic Core, a urethane & silicone combination providing improved dwell time and energy return. The frames also take advantage of a special graphite called Synchro Charge in the hoop that improves stability and feel on off center shots. The individual lines sport some other innovations unique to each series so let’s take a look at the options. The Dunlop Srixon Revo CX series is a crowd pleaser with players who want a traditional feeling frame that emphasizes control over power. The Revo CX 2.0 Tour is for the purist with its 95-inch head, 11.6 oz strung weight, 18×20 pattern, headlight balance and low flex rating. It offers the pinnacle of precision and feel in the CX series. Players who want the same high-quality feel with more forgiveness will have a couple different options. The Revo CX 2.0 moves to a 98-inch head size and reduces the weight to 11.3 oz strung. A slightly thicker, firmer beam and open 16×19 string pattern gives it easier access to spin and a little more pop without losing the classic feel. Players after something even lighter that still has a high dose of control will opt for the Revo CX 2.0 LS. 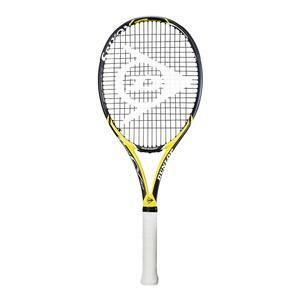 It moves the weight down to 10.8 oz strung, giving it a fast, whippy feel that still has outstanding feel and control. Lastly, players seeking the most forgiving and powerful of this control-oriented lineup should go for the Revo CX 4.0. It boasts a 100-inch head size for a larger sweet spot, and a firmer 24 mm beam for a more powerful response. The 10.6 oz strung weight of the 4.0 makes it the fastest swinging CX model. No matter the option, the Dunlop Srixon Revo CX series is best suited to players who want precise control over the ball and are willing to take less power in exchange for classic feel and responsiveness. Modern power players will be attracted to the Dunlop Srixon Revo CV lineup. Within the CV family there are 2 distinct branches. The frames that have an “F” designation sport an elliptical beam shape, have a faster feel and 16×19 patterns for excellent spin. The most advanced model in this branch is the Revo CV 3.0 F Tour. Its compact 97-inch head and 11.4 oz strung weight make it quick swinging, while it’s 69 RA, 23/24/23 mm beam ensures it packs a punch. Players who want the same power in a lighter package will opt for the Revo CV 3.0 F. It has a slightly larger, 100-inch head and a 23/26/23 mm beam for an increase in power over the Tour. The 11.2 oz strung weight is slightly lighter but still has enough mass to pack a punch. To go even lighter and faster swinging, players will want the Revo CV 3.0 F LS. It lowers the weight to 10.7 oz strung for maximum maneuverability. It keeps the 100-inch head and 16×19 pattern, ensuring there is an ample sweet spot and plenty of spin on tap. The other branch of the Revo CV family utilizes a different throat design dubbed V-Energy Shaft II. This V channel beam shape creates a powerful response by optimizing the throat stiffness of the frames. The heaviest hitting model is the Revo CV 3.0. At 11.2 oz strung with a 23/26/23 mm beam, it packs serious heat from the back of the court. The 100-inch head has a solid sweet spot and there’s plenty of spin to be had. For a bit more forgiveness and faster swing speeds, players can opt for the Revo CV 5.0. It increases the head size to 102-inches and lowers the weight to 10.4 oz strung. This combo makes it easier to accelerate and gives it a more forgiving feel. Its slightly head heavy balance improves stability and boosts the power from the baseline. Developing players who need to maximize hitting area can opt for the Revo 5.0 OS. It sports the largest head size at 105-inches. It also weighs in at 10.1 oz strung, making it the easiest to swing in the group. No matter the level of player, the Dunlop Srixon Revo CV family has a racquet that will amplify the power and spin in their game. The last lineup of Dunlop Srixon frames, the Revo CZ series is a blend of power and control attributes. They use a classic box beam throat for control, married to a rounded hoop beam for increased power. 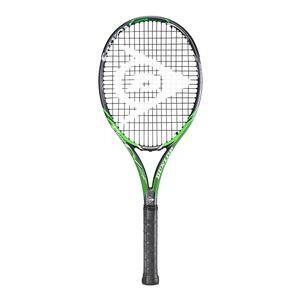 The Revo CZ 98D has a precise, maneuverable 98-inch head and fast feeling 10.7 oz strung weight. The 24/25/22 mm beam offers a nicely controlled level of power. It generates plenty of spin from its 16×19 pattern and has clean feel on contact. Players after something a little faster with even more spin will enjoy the Revo CZ 100S. 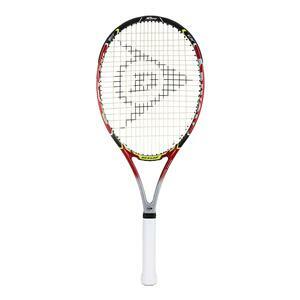 Its larger 100-inch head has a large sweet spot and the 10.5 oz strung weight packs solid power and stability. 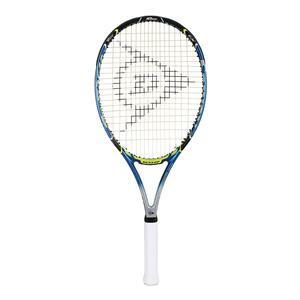 The 16×18 string pattern of the 100D helps generate tremendous spin from the ground and on serves. The CZ serious is perfect for developing players who want a balanced mix of power and control for their game. Dunlop’s partnership with Srixon is paying dividends in the form of multiple, high quality frame offerings. 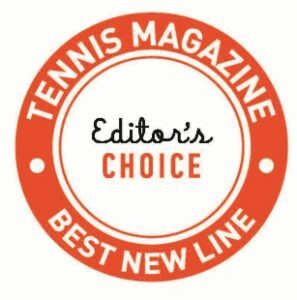 Boasting some of the best dampening and response technologies, their racquets are some of the best feeling options in their individual categories. 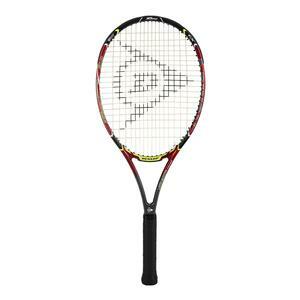 Whether you’re an attacking all courter, a baseline basher, or somewhere in between, Dunlop Srixon has a racquet to help take your game to the next level. About the Author: Matt Locke currently serves as the Junior Programs & Development Coordinator for USTA-Idaho and is an active USTA League and Tournament player.